Scott Rodgers hired to focus on Crescent Real Estate’s growing multi-family portfolio. FORT WORTH, TEXAS, USA, January 30, 2018 /EINPresswire.com/ — Crescent Real Estate LLC (Crescent) announced the hiring of Scott Rodgers as Vice President, Development to focus on multifamily development. Crescent, which expects to increase its involvement in the multifamily real estate asset class, will have Rodgers focus on sourcing and developing multifamily projects nationally in Crescent’s targeted markets. Crescent used the GP Invitation Fund I (GPI Fund), launched in 2016, to acquire multifamily assets in Texas, Illinois and Florida. The company’s current portfolio consists of more than 6,575 units of multifamily properties located in large metropolitan areas, with one location in Live Oak, Texas near San Antonio, Texas, and a location in Houston suburb League City, Texas. Other properties are in Chicago suburb Evanston, Illinois and Tampa, Florida. Rodgers graduated from Texas A&M University with a Bachelor of Science Degree in Environmental Design and The University of Texas at Austin McCombs Graduate School of Business with an MBA in Real Estate and Finance. 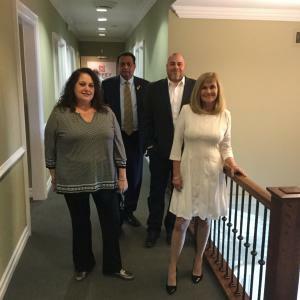 Prior to joining Crescent, Rodgers was Manager and Partner at Ascension Apartment Development, LLC and a Partner in Richman Ascension Development Group, LLC. He was responsible for sourcing and developing luxury multifamily opportunities for Ascension and Richman in Dallas, Austin and the Denver Metropolitan Area. 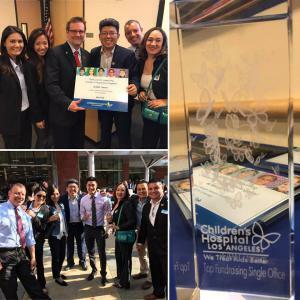 Rodgers also developed properties with CLB Partners, First Worthing Company and JPI Development which ranged from institutional multifamily, condominium, townhome and mixed-use developments. Prior to his career in multifamily development, Rodgers had an architectural background and was employed by Cooper Carry & Associates in Washington, D.C. and Overland Partners in San Antonio. BND Levante Group announced today that it has been awarded for Best Alternative Investment in Spain by The European Global Banking & Finance Awards 2018. BENIDORM, VALENCIAN COMMUNITY, SPAIN, January 30, 2018 /EINPresswire.com/ — BND Levante Group has been awarded for Best Alternative Investment in Spain by The European Global Banking & Finance Awards 2018. The European, over the last several years, has been celebrating achievement, innovation and excellence through its annual awards programme. The aim is to give corporate organisations an insight into various achievements within a range of organisations. All companies are nominated through our online voting system. We have a strict policy in place that prevents mass votes being submitted from any one location or IP address. Suspicious voting patterns are scrutinised thoroughly throughout this process. BND Levante Group was incorporated as an independent Spanish company to issue corporate bonds as alternative financing to buy prime real estate in order to meet the growing demand for short-term holiday rentals in Benidorm. 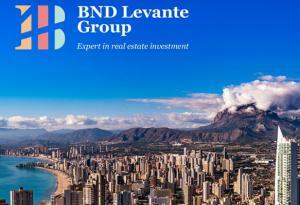 BND Levante Group owns and generates income from real-estate properties in Benidorm. It allows anyone to invest in real estate in a simple, easy and safe way: through the purchase of bonds online. Benidorm is the Las Vegas of Spain. Throughout the year, this city is occupied by 85% of tourists from all around the world. Benidorm is an ideal place for short-term rentals. Short-term rentals are the most profitable in terms of investment. The value of the bond is secured by BND Levante Group prime real estate portfolio. All bond holders have the first right on the prime real estate BND Levante Group buys in Benidorm. All the properties BND buys have a long-time history of rental income that will cover the interest rate on the bond. Independent Security Trustee with first legal charge over company assets for Bondholder protection. Secured and Asset Backed for peace of mind. ROSEMEAD, CALIFORNIA, USA, January 30, 2018 /EINPresswire.com/ — A new home ownership program allows qualified buyers to buy a home with absolutely no down payment. Many renters and first home buyers hold back on looking for a home because they assume they can’t break into the housing market without a sizable down payment. 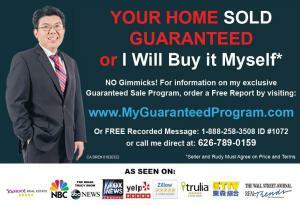 According to area realtor Rudy L. Kusuma, however, this thinking is false. Knutson at Downtown Brambleton received a Platinum Award from the National Association of Home Builders (NAHB). 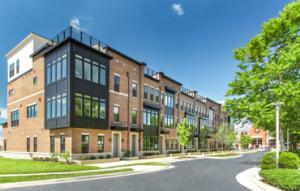 WASHINGTON, DC, UNITED STATES, January 29, 2018 /EINPresswire.com/ — Knutson at Downtown Brambleton has won a Platinum Award for the category Development Up To 5 Stories, Built For Sale, in the 2017 Best in American Living™ Awards (BALA) by the National Association of Home Builders (NAHB). Award levels, including platinum, gold, silver and Home of the Year, were announced at the NAHB International Builders’ Show. Knutson at Brambleton Town Center features four-story, elevator townhomes offering luxury urban living just steps from the array of shops, entertainment, and restaurants in the retail center. Blurring the boundaries between indoor and outdoor living spaces, these homes invite open conversation and a brighter way of life. An expansive rooftop terrace – referred to as your Yard in the Sky – provides owners a perfect retreat or entertaining space. This collection of townhomes is a successful blending of urban lifestyle, convenience, and community enhancement. The design intent of the homes and the land plan, was to help tie the surrounding suburban neighborhood to the Brambleton Town Center. By providing a more transitional modern architectural style, the architecture was meant to add a spark to the livability of the town center and encourage an active nightlife for the Town Center. Brambleton Town Center is a growing community, developed by Soave Real Estate and located in Loudoun County, VA, with a state-of-the-art library, movie theater, Harris Teeter, restaurants and parks and trails. Brambleton is also within close proximity to the Silver Line, Dulles International Airport, and the Toll Road, which provides easy access to both DC and Virginia’s vineyards to the West. Additional Information about the BALA program can be found at bestinamericanliving.com. The 2017 Winners Portfolio, featuring design trends and project photographs, is available online. VANCOUVER, BC, CANADA, January 29, 2018 /EINPresswire.com/ — Doubleview Capital Corp. (“Doubleview”) (TSX-V: DBV) is pleased to announce that it has acquired an additional 1,652 hectares of strategically-located mineral tenures staked adjoining the Hat gold-copper-silver-cobalt porphyry project located in the Sheslay district of northwestern BC, Canada. The newly acquired tenures extend the Hat property to the north and northwest of the historic claims where the Lisle Zone was discovered in 2013 by drilling. Hat tenures in the Sheslay area now total 6,308 hectares. “The new mineral tenures represent a significant addition to the Hat Project, increasing our holdings by over thirty-five percent,” said Doubleview’s president and CEO Farshad Shirvani. “This is strategic ground for the project, identified by our technical and geological teams, and I am very pleased by the recent progress of our technical and geological team in developing an aggressive approach to furthering our exploration of the Hat property. In the near future, I will be announcing a major program of technical surveys and drilling that in addition to the Lisle Zone will explore several parts of the property for the first time that have characteristics similar to the Lisle Zone and that fit well with our newly-revised deposit model”. Doubleview’s News Release of January 23, 2018 disclosed up-dated metal values and a revised Lisle deposit model including a possible continuation 2 km south to the “Hoey Gold” area. The Hat Property is fully permitted and is equipped with winter-ready camp and facilities. Doubleview and its exploration personnel are well experienced in cold weather operations and the 2018 program should have a quick start-up. Details of the program will be announced soon. * CuEq figures employ the following metal prices: Gold: $1300/oz, Copper: $3.0/lb, Silver: $17/oz, and Cobalt: $35/lb. CuEq. calculations are presented in US dollars and will vary with market and currency fluctuations. 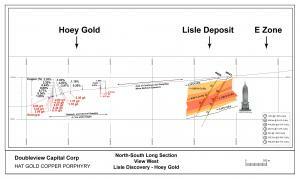 Prospecting and surface sampling in the Hoey Gold area of the Hat property have shown assay values as high as 7% copper and 8.1 grams per tonne gold. The Company believes that the Hoey is potentially an important addition to the Lisle deposit. Erik A. Ostensoe, P. Geo., a consulting geologist and Doubleview's Qualified Person with respect to the Hat Project as defined by National Instrument 43-101 Standards of Disclosure for Mineral Projects, has reviewed and approved the technical contents of this news release. He is not independent of Doubleview as he is a shareholder of the company. Doubleview Capital Corp., a mineral resource exploration and development company, is based in Vancouver, British Columbia, Canada, and is publicly traded on the TSX-Venture Exchange [TSX-V: DBV], [OTCBB: DBLVF], [GER: A1W038], [Frankfurt: 1D4]. Doubleview identifies, acquires and finances precious and base metal exploration projects in North America, particularly in British Columbia. Doubleview increases shareholder value through acquisition and exploration of quality gold, copper and silver properties and the application of advanced state-of-the–art exploration methods. The Company's portfolio of strategic properties provides diversification and mitigates investment risk.